I first met Benjamin in London, at Kings Cross Station. As we sat for coffee and cake, at Carlucci’s coffee shop, overlooking the constant flow of trains, Benjamin offered me a delicious cake, announcing how he was breaking a recent fast. Soon, we were talking and sharing experiences. As Benjamin unravelled his life journey, I became fascinated with his unique experience that weaved together a profound spiritual journey of 30 years in Zen Buddhism, a career in Finance, and more recently, Futurism. Benjamin J Butler is a Futurist, Writer, Speaker and Coach. He is Founder of the Emerging Future Institute, a writer at Intelligent HQ and a member of the faculty of Futur.io,the European Institute of Exponential Technologies & Desirable Futures, dividing his time between Hong Kong, South Korea, the UK and sometimes the USA. He has worked extensively in Asia and is fluent in Japanese. 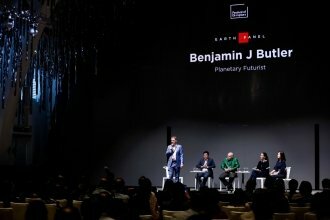 Known for his ability to forecast cycles or paradigm shifts in financial markets, society, technology and geo-politics, Benjamin has been a trusted sounding board and advisor for many leaders, coaching them through uncertainty in both their business and life; and to cultivate a futurist mindset . He leverages off a unique array of international experiences and roles including fund manager, stockbroker, venture capitalist, innovation consultant, and zen meditator, seeing himself as an observer of the human mind and decision-making. One of Benjamin’s recent passions has been the pursuit of the Holy Grail of creativity and the quest of self-realisation . In addition to a period of investing in Silicon Valley, he spent a number of years travelling around the world meeting visionaries, entrepreneurs, creatives, martial artists, and even Zen Masters and the Dalai Lama’s Oracles (! ), with the goal of discerning states of mind that lead to insight. He believes that the harnessing of collective intelligence will result in a new form of Enlightenment. In this interview, we journey together through his creative, rich life, filled with adventure, change and insight. 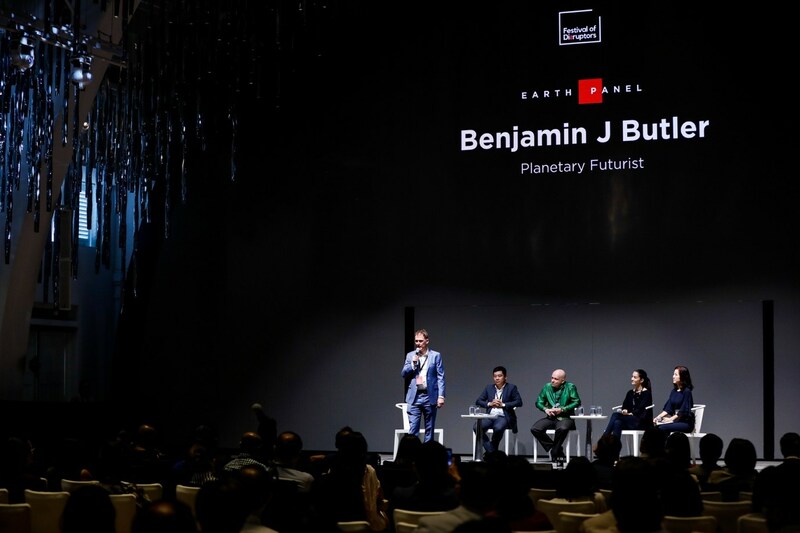 Benjamin also shares his prognosis of the future and speaks about his upcoming book, which is a dialogue between a futurist and Feng, a young Chinese journalist. The interview is published in two parts. You are a speaker, blogger and writer about future. What does that mean, what is a futurist? Since ancient times people have always been fascinated by the future – from Nostradamus to HG Wells in the 20th Century and to the Singularity spoken about in the 21st Century. A roomy definition of a modern-day futurist might be someone who explores possibilities and probabilities about the future. Many futurists today operate in the corporate world, or work for governments or the military, as consultants. Some observers might date the beginning of modern futurism to 1902 when the writer HG Wells gave a talk at the Royal Institution in Mayfair called “Discovery of the Future.” He discussed the knowability of the future and why it was important to study it, predicting that one day there would be professors who lecture on the future just like history lecturers discuss the past. This turned out to be true, although the field first developed in the military and corporations. During the cold war the strategist and futurist Herman Khan introduced the idea of scenarios. He thought it was his job to ‘think the unthinkable’. With scenarios, futurists explore a number of possible futures. They might assign probabilities to these futures but one of the key utilities to the exercise is to go deep into each scenario to see what would play out, and discover what ‘you didn’t know you didn’t know, but you probably should have’ – a phrase that Jerry Glenn, Founder of the Millennium Project is fond of saying. The first well known corporation to introduce future scenarios was Shell. A futurist called Pierre Wack pioneered this effort, and he came to fame after doing scenarios which anticipated the Oil shock of the 1970s. He wrote a number of articles in the Harvard Business Review which perhaps contributed to the growth of the corporate futurist. Wack suggested that scenarios dealt with both facts and also should lead to fresh perceptions amongst leaders. Many other companies then followed Shell’s lead. Since the 1970s we also a number of Universities start to introduce future studies. I believe that Jim Dator at the University of Hawaii was one of the early pioneers. They endeavour to take a scientific and empirical approach to exploring the future. Today, Sohail Inayatullah is doing pioneering work in Australia with his Causal Layered Analysis approach. However, I would say that there might be as many futurists as definitions, and many would include writers and science fiction writers into the fold such as Arthur C Clarke and Isaac Asimov. In a way, that’s what attracted me to the field. I could be both analytical, using a system-based and trans-disciplinary approach, and be imaginative and creative. Historically, the futurists might have been the advisors and counselors to the Kings and Queens – or Jesters, speaking uncomfortable truths! They used to speak of seers, or see-ers, and these people were able to look to the horizon, and see bigger trends and events. I actually like helping people cultivate their imagination and a futurist mindset, so I enjoy working one on one with people and not just with large organisations. 2.Very interesting. Well lets go back a gear now and get some more context. Can you tell us about your life’s journey, what were the transformational moments, and what led you to becoming a futurist? On the surface I had a pretty archetypical middle class English childhood. In other words I was quite blessed overall. At primary school I had really struggled because I seemed to learn differently than other children, and often felt very uncomfortable. But then I moved to a boarding school which had been the ancestral home of Florence Nightingale, in the idyllic Hampshire countryside. And after my House Master Mr. Fawkes (descendent of the infamous Guy Fawkes) said that he believed in me, my grades sky-rocketed. I think he also planted the seeds of my somewhat contrarian or ‘subversive’ nature – although I must admit I’ve never contemplated blowing up Parliament as he tried! Rather stupidly, though, I thought that if one is getting good grades you either study Law or Medicine! So I decided to do Law at Kings College London. Eventually, though, after an eye-opening visit to Hong Kong, I was increasingly attracted to travelling the world and felt that a legal career was not the path to do this. My head told me to finish the Law degree but my heart was yearning adventure. On this occasion my heart won out and I switched to another London University called the School of Oriental and African Studies in order to study Japanese and Economics. What a fantastic place that was, a cauldron of nationalities and characters all passionate about what they were studying. This led me in to a career in international investment, primarily as a bridge between the USA and Asia. Over the years I advised many fund managers and Chief Investment Officers on how to deploy their capital and then became an investor myself. It was perhaps the best training ever to understand the world in which we live because investment touches on so many different industries and systems, and I was always fascinated by perspective. I also had some pretty unique mentors along the way who taught me about cycles in economies, financial markets and society. It was a very different education than had I done a more traditional MBA. However, one day I woke up and felt like I was trapped in the movie “Ground Hog Day.” On the surface my job seemed to be interesting and different each day, but I was now yearning to do something more profound than making money for other people, something with deeper meaning. I found that despite having much success at the material level, I was starting to engage in self-sabotage and drinking way too much. In the end I realized that I had to find my life’s calling and that finance was part of my life – good whilst it lasted – but not everything. I started Zen meditation and I quit my job at a Swiss bank. I became very attracted to entrepreneurship as I felt that that this world was premised on abundance instead of scarcity – the world of Malthus – as I described it. I felt that the corporate world was too obsessed by scarcity, in fact sometimes they encouraged it as this was a way of making money. Interestingly , Malthus was the economist for the East India Company. However, my sense was that humanity’s creativity was infinite. With a very good friend from university who had been in the start-up scene since the late 90s, Adam Lindemann, I co-founded Mind Fund investing in start-ups as a venture capitalist in California and sat on the board of a number companies. It was a fascinating adventure. I was still endeavouring to discern trends, but I was now intimately involved in supporting the leadership teams. The learnings I was gaining from my own inner work was increasingly becoming useful in advising others. Then I seemingly entered a stage of my life where things didn’t exactly make sense or have an overall coherence and at times I got quite confused. It seemed like I was dabbling in too many things. I love Schopenhauer’s comment that life doesn’t make sense forwards only backwards. I was convinced that one of the most important things missing in our society was dialogue – true dialogue – and I helped establish an institute researching and teaching it at a leading design school. I was shocked how little literature there was about the art of dialogue. At the same time, I was also writing about global trends and financial matters with a Wall St legend, Richard Russell, at Dow Theory Letters. And I had some clients who were still paying me to discern global trends and forecast the future. Frequently I would also go off on retreat for several weeks or do long distance pilgrimages around beautiful places for inspiration. On the surface it looked quite confused and confusing, especially to my dear wife! Eventually, I had an ‘aha’ moment when it was time to integrate everything I was doing, and that’s when I became a futurist. I was tired having a double life, perhaps even multiple lives! Using this ‘title,’ I gave myself permission to be trans-disciplinary, looking at developments in all fields, but also my imagination which I think is very important when it comes to building a better future. But that integration process would take time. In January 2015 I experienced quite a shock with the sudden death of my younger sister, who had just given birth to her baby daughter. A phone call in the middle of the night from my father changed the course of our lives. Just 2 weeks after my sister’s funeral I witnessed the birth of my own daughter. So in one month I experienced the circle of life and death. Since then, I guess a sense of mortality and the preciousness of life pervaded my life more than ever and I felt an urge to clarify more what I was meant to do. At times, when I’ve veered off my calling I have really suffered. But now I think I know what it is I am meant to do. So what’s your prognosis of the future today? What are the main trends , and the main challenges and opportunities ? Wow, that’s a big question! We do live at an exciting time, with the incredible convergence of many technologies which are all seeing exponential growth from biotech to AI and robotics. The next 10 to 30 years could be quite incredible from a technological perspective. In fact, Vernor Venge and then Ray Kurzweil have both spoken about the acceleration and convergence of these trends resulting in a moment beyond which it’s almost impossible to see because it’s like dropping in to a Black Hole. They borrowed a term from physics and called it the Technological Singularity. However, at the same time it would appear that we are also facing growing crises, including economic (wealth disparities), financial (huge amounts of debt), ecological (collapse of biodiversity and not just climate change) political (break down into tribal politics) and geopolitical (international tensions). I would often say that the world appeared to be getting better and worse at the same time, the Great Paradox. Now destruction is part of life so we don’t need to be too scared by it. And our current systems are far too centralized. Since the turn of the century, many futurists and scientists have increasingly become quite dystopian. Many think tanks around the world have been set up centered around existential risk from Oxford and Cambridge to Princeton. Stephen Hawking also made the headlines about the possible extinction of human life. I think for us to avoid the worst outcomes we must adopt more decentralized systems as nature have proven that these are more resilient. We should see this in our political structures (power going from central government to towns and cities), manufacturing (from concentrating everything in large factories in China to 3D printing and the Maker revolution), companies and organizations (becoming more self-organised and swarm-like), economies (Central Banks to Blockchain-based currencies) and energy structures (again locally generated energy). The writer Rifkin has touched on some of this is his works on the Third Industrial Revolution. If we do this then we are much less likely to commit a species-wide suicide. I am quite optimistic because it seems that we are in the midst of a major shift in perspective, or consciousness. This is all far more important than which new tech product is going to sell well next year, often the topic of most technologists.